After years of using a standard simulator with his students, Aaron began to realize the inaccuracies, and proactively struck a plan with the Club sport and health to redesign the golf simulator as we know it. Aaron’s simulator is tapered, much like a balls trajectory. This simple change allows a golfer’s shot to soar freely in the air before hitting the screen, rather than bouncing off of the ceiling, which renders the shot to read inaccurately. Another improvement Aaron made was to modify the flooring material golfers hit balls from. When putting, the surface is smooth so the ball rolls true and on line rather then bouncing over sensors in the floor and instead of hitting from a thinly covered cement-like surface, Aaron inserted a flexible mat for more realistic, softer ball contact. This prevents the club from skipping off of the hard floor before hitting the ball, this also reduces joint pain and makes the swing feel more like it is taking place on a real golf course for more efficient practice, which makes for a seamless transition to outdoor play. Inner Quest students can store their clubs for no charge. 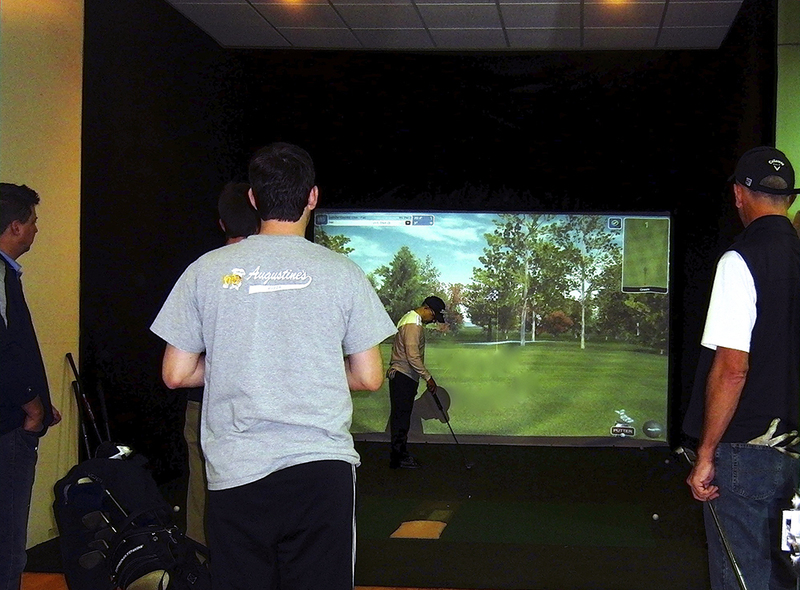 Our indoor practice area is much more then just the best and most realistic simulator around. We have a 36,000 sq. ft. indoor turf area for short game training and two putting greens that run at a stint meter speed of 10 and 11. Our greens can be set with different contours and breaks to give our students all kinds of challenges. We also have a wide verity of training aids that can be used or bought by are students to help them improve from tee to green. We have over 200 machines to keep you up on the latest golf exercises and physical training. Your instructor is also sure to implement mental focus and breathing exercise to help with those high pressure situations. Inner Quest Golf is consistently ahead of the curve when it comes to your game, we have everything a golfer needs for indoor and outdoor training.